AutoKinetics will be open for half day this Saturday 9 Feb from 1045am to 3pm. We will be closed from this Sunday 10 Feb to Wednesday 13 Feb.
Operations will resume on Thursday 14 Feb.
AutoKinetics wishes all a Happy and Prosperous Chinese New Year! Have a great long weekend break! Questions, a normalcy bestowed upon the daily frequency, encountered. We ask them without asking, seek answers without searching, and yearn for truths without speaking. Everyday a torrent of people pass us by, those we know and those we don’t, those who deserve and those who demand. Once a year for most of us, we stop this flow, turn off the road into one filled with what we know but rarely visit, a reflection of our soul. To seek and to reconnect, to those we know. To see and greet the young and old, bound by blood, by love, a story of generations and tradition unfold. We stop to restart, refresh and renew. To feel warmth and love, reaffirm kinship. For those who are married, to become poor in pocket but richer in soul. When the day comes to a close it sure feels good doesn’t it, to be alive. To feel the sense of satisfaction when seeing faces and people we know, that our blood sweat and tears are borne out in the generations, and the warmth by relation and love, continue with tradition set forth by those before us. Happy CNY friends! For our non-Chinese friends, a restful holiday. This holiday may hold different meanings for us, but in friendship and reality we all enjoy one way or another. May this year bring all of your wealth, health and love. 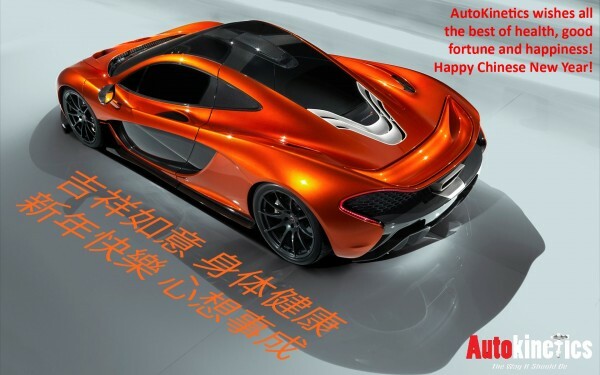 AutoKinetics wishes all Happy Lunar New Year! Blessed Merry Christmas and Joyous Happy New Year 2014! Happy Mother’s Day (especially Mothers who drive)!! !